Do you want to give your body all the nutrients it needs? That is the basis for maintaining iron health and to help you get it. In Robis we bring you everything you need, also superfoods! Still, do not know what they are? Superfoods are food supplements that bring together a number of vitamins, antioxidants or healthy fats that help our body stay healthy. Do not forget that the most important thing is to have a balanced diet because these superfoods are not substitutes, they are the ideal natural food supplements for your health. In addition, we must do sports regularly, sleep the necessary hours and not have habits of consumption of products harmful to our bodies, such as alcohol or tobacco. In our catalog, you will find some of the best superfoods, such as chlorella, an alga rich in amino acids, chlorophyll, and antioxidants. She is a great defender of our health! Spirulina is another one of those superfoods that will help you to be like an oak. Its composition is rich in phytochemicals, vitamins, and minerals. It offers many proteins so you will never run out of energy to face your day today. Do you want a mixture of the two? Find her in Robis! In a single product, we offer you two superfoods so you can take care of yourself as you deserve. The best of chlorella and spirulina together so you can get all the nutrients you need. Maca is a tuber famous for all the nutritional qualities it has, but it goes beyond! It is also a product well known for having positive effects on fertility, as well as sexual dysfunction, both male and female. Of course, another of the most complete superfoods you can find. Do you want to enjoy all these advantages? 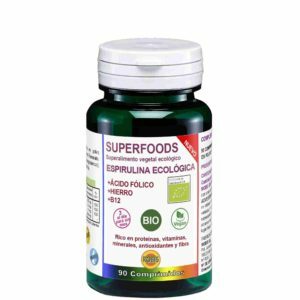 Remember to take a balanced diet, be properly hydrated, get away from sedentary life and complement your lifestyle with the superfoods of robis.es that will help you to be one hundred percent. Do not hesitate to try it!